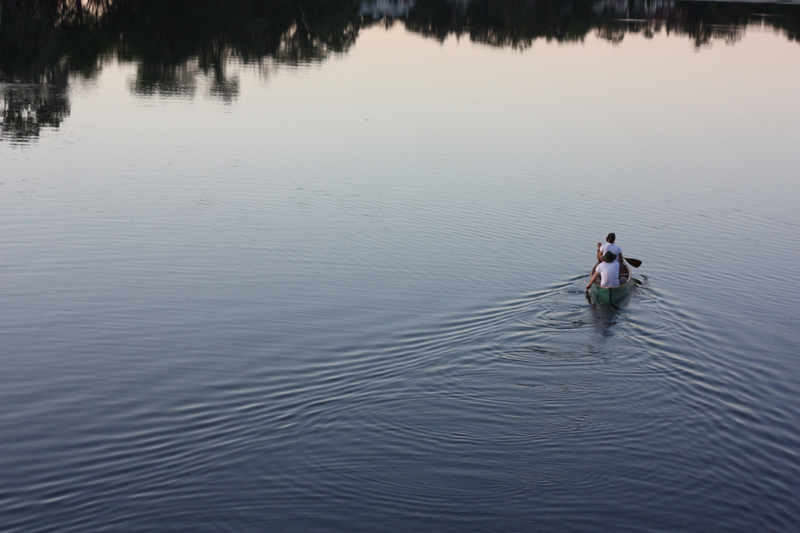 It's no secret that Minnesota has great flat water paddling opportunities. Our state motto is “The Land of 10,000 Lakes,” and even Minneapolis can be broken down into two parts: minne-, which derives from the Dakota Sioux word for water; and polis, the Greek word for city. I mean for goodness sakes, it’s a part of the school curriculum to teach students how to paddle a canoe. 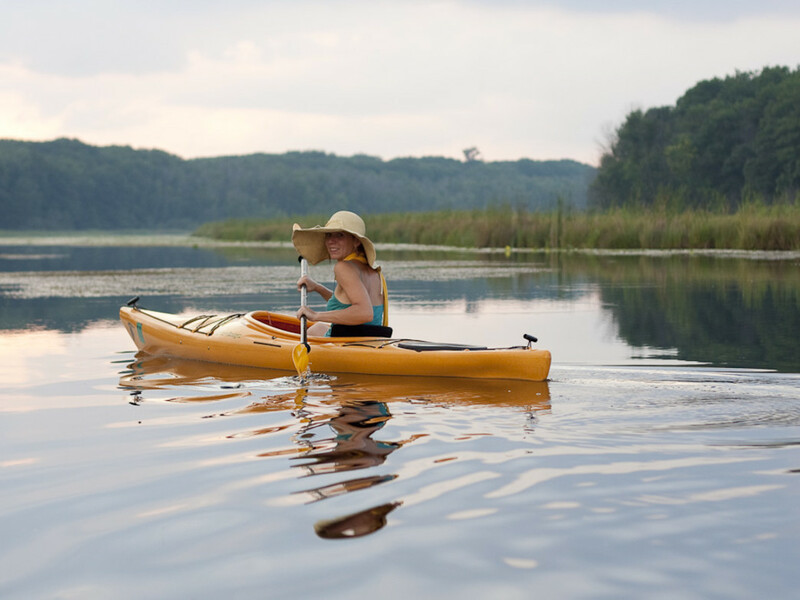 It is obvious to see that Minnesotans are born and raised to paddle, which is why Twin Citizens take full advantage of the bountiful paddling opportunities found in the metro area. There are not too many cities that can boast having three major waterways to paddle: the Mississippi River, Minnesota River, and the sleepy Minnehaha Creek. Not to mention 20 different lakes and wetlands to explore. All of which are found within the city’s limits. Here’s our insider guide for flat water paddling in the Twin Cities. Just a hop-and-a-skip from downtown Minneapolis is a 13-mile circuit of interconnected lakes called The Chain of Lakes . Nestled in the vibrant Uptown neighborhood, it’s hard to believe that flat water is only a stone’s throw away. The rim of the lake is often overcrowded and bustling with runners, cyclists, and sunbathers. But, the lake itself offers its calm waters to flat water paddlers wanting to see the city from a whole new perspective. 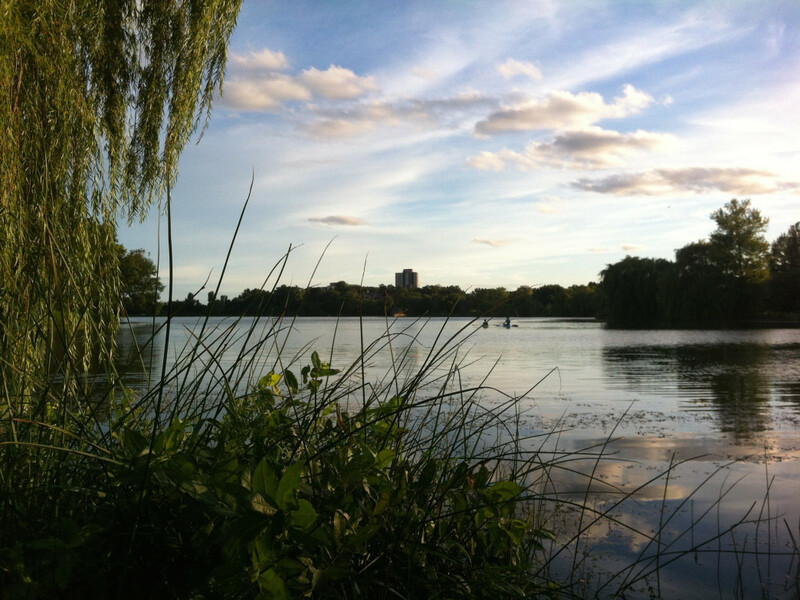 There are four different lakes within the Chain of Lakes loop: Lake Calhoun, Lake of the Isles, Cedar Lake, and Brownie Lake. Each has their own personality, which is why it is important to visit each one. Most paddlers start at Lake Calhoun, since there is a boat dock, as well as boat rentals available from Wheel Fun Rentals. When paddling Calhoun, it is fun to glide along the shore and watch as civilization whizzes by. Also, the best view of the Minneapolis skyline can be seen at the southwest corner of the lake. North of Lake Calhoun, through the water alley is Lake of the Isles. Named after the two islets found in the center of the lake, which host over a hundred migratory birds, this lake is perfect for some bird watching. Be on the look out for mallards and great blue herons. Or you may be lucky to catch a glimpse of the elusive night heron or horned grebe, which nest off the islet’s shores. As for the lakes that will make you forget you're in an urban metropolis, Cedar Lake and Brownie Lakes offer its visitors quiet waters and scenic views. Especially in the fall, there are photo opportunities galore when the lakes burst with autumn colors. On any given summer weekend, you will see groups of people on this sleepy creek: inner tubers taking it easy, canoeists practicing their J-strokes, and fishermen snoozing with their poles in hand. There is nothing better than taking a relaxing paddle on Minnehaha Creek . The headwaters are west of the cities at Lake Minnetonka. The creek then meanders through tranquil forest, marshy wetlands, fancy golf courses, until reaching the urban wilderness we call Minneapolis. The whole route can take up to 6 to 9 hours to complete, so most people divide it up into sections. Near the headwaters, it's hard to believe that you are in the heart of suburbia. 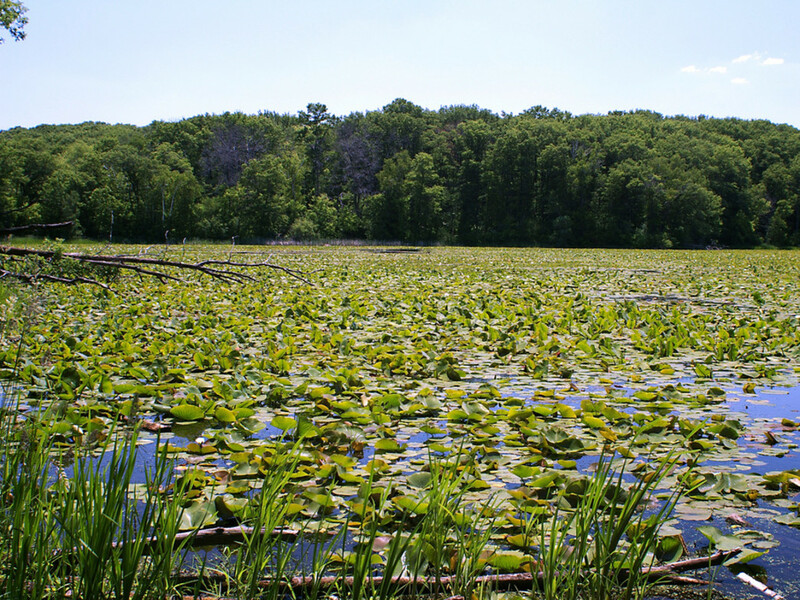 As you pass the undeveloped wetlands, look for blue herons, redwing blackbirds, and painted turtles; and enjoy the sounds of lapping water and reeds rustling in the wind. Once you reach the city limits, be prepared to get your feet wet due to the mandatory portages along the way. The water trail ends just before the mighty Minnehaha Falls, which is a great place to rest your shoulders after a long day of paddling. Sometimes you've just got to get out of the city. And only a short distance away is one of Minnesota’s designated scenic waterways, the Rum River . (Technically the headwaters start all the way up in Itasca, but most people start their trip in Cambridge, which is only an hour north from Minneapolis.) The most common route is the 35-mile section from Cambridge to the river’s confluence at the Mississippi in Anoka. There are limited riffles and little to no rapids, so most paddlers enjoy setting down their paddles and letting the river guide them. Not only is the Rum River a beautiful waterway, but also it is rich with history. Once known as the Spirit River by the local Dakota tribe, the Rum can, indeed, be quite spirited in certain sections. And though the river looks wildly different than when the Dakota lived along its shores, there are still sections with its original character. So, while exploring this scenic river, look to the shores for white-tailed deer sipping from the water's edge; peer up to see hawks circling above; or keep a keen eye below to catch a yellow glimmer of a walleye. With enough planning ahead and an adventurous spirit, there are a few available campsites that can turn your day trip into a multi-day adventure. 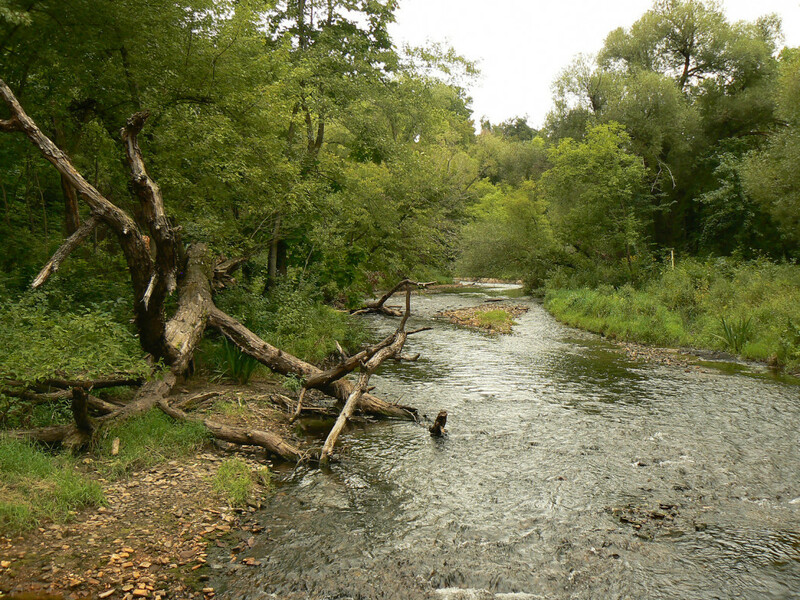 When the Northern Woods is just too far away, it’s a welcome relief to have Lebanon Hills Regional Park’s 13 miles of hiking trails and 2.5-mile canoe route only 30 minutes away from downtown Minneapolis. While on your first portage, it’s easy to forget that you’re in the heart of suburbia. The only thing that’ll remind you is the distant honk of a horn or the nearby laughter of boy scouts earning their wilderness survival badges. Thankfully, the lapping water hitting your canoe and the birdsongs usually mute these sounds.